Power tools have never been more accessible and affordable than they are today. The many options and brands to choose from can seem very intimidating. Because of this, people often purchase the wrong tools due to the wrong advice or lack of information to understand what they really need. For the most part, tools are job-specific which means if you buy the wrong one, you could be at a loss until the right job or project comes along. The right power tool should not only accomplish your project, but save you time and physical labor. I preface this article for those readers that are just starting out or looking to begin their own business that requires power tool equipment. Follow along below to uncover what essential power tools you should stock up on for your business. Every contractor or construction has its own unique needs for tools and equipment. While many projects can seem similar, no two jobs are ever exactly the same. For starters, always kick things off with safety. 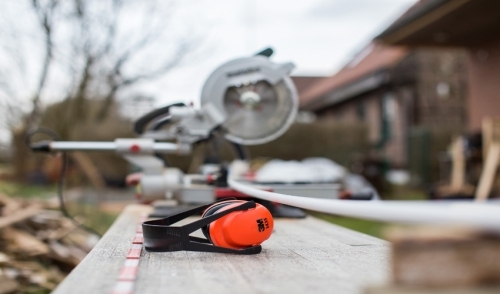 Before you can start using circular saws and nail guns, have the proper safety equipment such as safety goggles/glasses, gloves, and proper footwear. The basic power tool requirements for any upcoming business are the following: saws, drills, and nail guns. Saws are important to cut anything and everything that needs to be fitted for your project. They come in many sizes, styles, and functions. Table saws are staples in any carpentry business, but an inexpensive cordless circular saw can still accomplish most tasks quickly and effectively. For more custom projects and hard to cut areas, pick up an oscillating saw and a jig saw. The combination of these three saws will enable you to tackle any job that comes your way. The next power tool to grab is a drill or a couple of drills. This might sound obvious, but everyone should own a drill. The applications of drills are far greater than the sum of their parts. Make sure to grab a handy tool set that comes with all the bits and drills you will need for most jobs. Stock up with both your standard cordless drill and a hammer drill to tackle larger projects. The last power tool to always have in your toolbox is the nail gun. If you’ve ever used a hammer for a significant period time, you will understand how useful a cordless nail gun can be. A cordless brad nailer can cut efficiency in half when building frames and installing molding. Don’t spend countless hours hammering away when you can save time, money, and labor in the long run with a nail gun on hand for your business. My final tip for beginners is to always have extra batteries available. Have at least one for each power tool you have to avoid losing time on the job. When purchasing these items, be on the lookout for quality sales among top brands and combo deals. Combo deals are when you buy a combination of tools for a lesser value. If you’re ever unsure, don’t hesitate to rent the tool to try it out before officially buying it. Renting is a great way to save money and learn what might work best for you and your business. Take your time when stocking up on the right tools. Building a toolbox is a journey for everyone and there’s plenty to learn along the way. As you’re starting out, don’t be afraid to ask questions or even borrow a power tool to learn more about it. Consider your storage options too as you stock up over time. These tips will give you the direction and guidance you need to begin building the ultimate power tool box for your business.